It should go into the action only when the position is in profit (or at a break even point). It should apply itself only when the difference between the current stop-loss and the current market price is greater than the trailing stop value. Trailing stop should never «decrease» the stop-loss level. If used without the initial stop-loss, trailing stop doesn’t protect your position from the excess losses; it only provides a good profit-following tool. This way of setting your trailing stop-loss is very convenient but it has two important disadvantages. The first con is that it doesn’t allow trailing stop lower than 15 pips. That’s probably not a problem for long-term traders, but it’s a great trouble for scalpers and short-term traders. And the second disadvantage of this method is that it doesn’t work properly with the brokers that provide extended quotes (5 and 3 digits after the dot instead of 4 and 2 digits). Trailing stop confuses the pips in this case and acts incorrectly. #property copyright "Copyright © 2009-2015, EarnForex.com"
Kicks in when position reaches at least TrailingStop pips of profit. As you see, the code is really simple. You can also download this trailing stop EA and use it freely with your orders. This version will start trailing stop-loss when position reaches profit, which is greater or equal to your given trailing stop value. You can also download a trailing stop EA that will start working when any positive profit has been reached or the one that will trail stop-loss immediately whenever current stop-loss lags behind the current price for the given trailing stop value. The latter version does not have a common stop-loss function for obvious reasons. While it lacks the disadvantages of the first MetaTrader trailing stop method, unfortunately, it also has two of its own important disadvantages. First, it works for all currently open orders. So, if you want attach it to only one order and leave another one without a trailing stop this method is not for you (but, of course, you can alter this EA to work with some specific orders). Second, it utilizes the same trailing stop value for all orders, you can’t set 10 pips trailing stop for one position and 50 trailing stop for another one. In case you want to use different stop-loss values for different orders you’ll have to heavily alter the code of this MT4 expert advisor. Update: Added stop-loss option, which might be useful if you want to complement some expert advisor that doesn’t set stop-losses on its positions. Update 2013-02-28: Added two other versions of MT4 trailing stop. Please see the paragraph below the source code for more details. The original version has been also updated for some error reporting capability. Update 2013-07-31: Fixed stop-loss modification error, which could potentially move the SL level backwards. Thanks to Reynald for reporting this bug. Update 2015-10-30: Fixed OrderModify() function call to avoid modification of order expiration parameter. Also, removed arrow color for order modification to reduce the chart noise. If you have some questions, suggestions or bug reports regarding the presented trailing stop code, please feel free to share them using the form below. Different Stop-Loss Types — Which To Use? how to use your trailling stop? Doesn’t this article explain exactly what you ask? This is exactly the same problem what I have too..
How to use this trailing stop…? Where can I place this code? Should it be in a single text file? Where do I have to place the file? What filetype should it be? I am sure if it is a .txt file, it will not work. This code should be inserted into .mq4 file and compiled with MQL Editor and then attached to the chart where you trade. But if you don’t know that then this code will probably be of no use to you since it requires some modifications to work properly with your orders. In your case I’d recommend sticking to MetaTrader’s built-in trailing stop solution. tell me how to use tsl,stop lose at 50pip or 100pip…or…..
Great info you got here. It’s really been helpful. Thanks! Thank you so much. I am beginning to get confidence with the use of the indicators. No problem. If you have any problems with trailing stop, just ask. how do i edit the EA to the amount of pips i want my trailing stop to be? If your EA supports trailing stop, it’s usually configurable via the input parameters. If it doesn’t support trailing stop, you’ll have to either modify the EA’s code to add such support (which is quite difficult, especially if you don’t know how to code in MQL) or to manually set the trailing stop on the positions opened by this EA. Hey! Thank you so much for this code. I was wondering, if I wanted to take this trailing stop and make it a part of one of my robots, could you tell me which part of the code I need, and where to paste it in my robot’s code? Everything in the start() function except “return(0);” line. Paste it anywhere in your EA’s start() function. But if you couldn’t figure that on your own you’ll probably have some problems with that. I am quite comfortable with the Trailing Stops article. But where and I do I place the code for the Trailing Stops. In your EA, but if you aren’t a coder you don’t need it. the order is rising and has reached the 1.2180 trailing stop starts and gets in 1.21750 stop if it will continue to rise increasing the stop of a 1 pip in the event of a downturn it gets 15pips. excuse me but it was translated into English via google! You can substitute 15 with some input parameter name to make it variable. But do not forget to declare the input parameter in the beginning of the EA. how do I make this change you suggested, what name should I put, I know nothing of programming. I tried to use the way you instructed but the trailing stop is varied for less, is what I need it to be fixed as above exemplifiquei when 20 pips higher than expected it hangs on the stop 15 pips cso continue to rise it rises to 01 01 pip if he goes back to at least 15 pips or as rose was increased from 01 to 01 pip, is it possible? I don’t quite understand what you are trying to suggest. Would it be hard to do the same for stoploss and take profit. 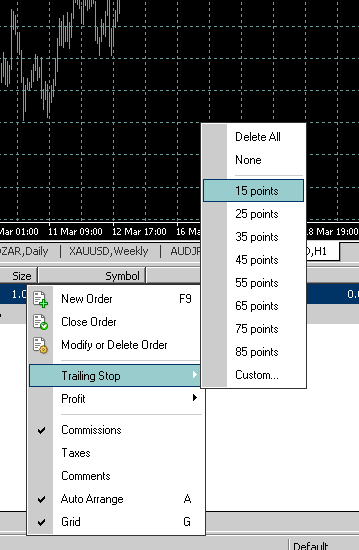 I had not thought of a separate EA for Trailing Stop until I read your post….. and now I am wondering it could also be applied to the other two… ie would Metatrader allow same. Thanks for your great resources in your site…….! Thank you very much for your kind service. Wish you all to be success…..! Thanks for the nice work around. I downloaded, edited and installed correctly. However, when I try to use the trailing stop indicator it did not show up in my chart. How do I know if it’s working? It should expert advisor, not indicator. If you attach it as an expert advisor you will see its name appearing in the top-right corner of the chart with either “X” or a “smiling face” symbol. Enable EAs to turn it on (it should show a “smiling face”). Thank you. This EA works great. My question, The stop does not exist until the position is at least at breakeven, is this correct? In any event, I really like your trailing stop EA. If you have a PayPal account I will send you five bucks as a token of my appreciation. Yes, the stop-loss isn’t added until that. You can add stop manually if you want it before the breakeven. Thanks, but your appreciation is enough for me :). Just telling your friends about my site would be great. If I add a stop manually, will it go away when the trailing stop EA kicks in? I will tell my friends about your site. Yes, the trailing stop will change it. My broker told me that 15 points actually is 1.5 pips e.g. 10points= 1pip. Yes, some brokers use fractional pips, where 1 fractional pip = 0.1 normal pip. Hello, I can not make my trailing stop EA work, although I installed and lunched it correctly, there are no any errors in MT4 experts or journal. I am testing various of values in property’s input now. If you have any other suggestions, tell me please. Do you have any open positions? No, I don’t have opened positions now. And why are you interested? Do you have any suggestions? I know how EA works, when I told you that I can not make it work, I was meaning that I can not make it work on opened positions…. I am opening and closing many positions, the trailing stop EA is turned on, but it doesn’t apply any trailing stops. Thank you for answers, I estimate your effort but I feel that you shall not be able to help me.. I applied your trailing stop ea. I see its default setting is 5.0. Does that mean its set at 5 pips? Does the ea only kick in when the break even is reached? i.e If I open a long trade at 1.0020 with my stop loss at 1.0000–will the ea only kick when the trade hits 1.0040? And then if the trade turns down to 1.0035 will the trade then close with a profit of 15 pips (with the default setting of 5.0)? What I’m looking for is a trailing stop ea that with the above scenario will move the stop loss up by 1 pip to 1.001 when the trade moves up by 1 pip to 1.0041 and so on–so if the trade turns down then I’ll make one pip. Why I’m asking is because too many of my trades turn before they reach break even (say at 1.0032) then I don’t make any profit and get kicked out at 1.000 at -20 pips without the trailing stop ever coming into play. I want the ea to lock in any profit as soon as the trade moves up. Could you tell me where I could find something like this? The listed trailing stop EA comes to play only when the position has at least TrailingStop pips of profit. If you open a trade at 1.0020 with TrailingStop = 5, it will move your stop to 1.0021 (1 pip of profit), once the price reaches 1.0026. MT4 gives quotes of 5 digits lets say in the example above trade at 1.00205 ok ? I have MT4 with minimum 20 points and i have noticed it counts the last digits as points meaning when the price goes up 1.00215 it is 10 points and when 1.00225 it is 20 points and when 1.00235 it is 30 points whereby the trailing stop then sits at 1.00215 . This is great for scalping but manier times i have noticed with 1 lot 1 pip up is $ 10 ok and lets follow the above example the price went up to 1.00230 which is 25 points up and 25 $ up with 1 lot correct . So technically the trailing stop should move up by 5 points now that the profit is 25 points greater then the preset value of 20 so the take profit now should sit at 1.00210 if price returned and should give me a profit of 5$ expected BUT NO THE TRAILING STOP DOESNT SIT THERE AND IT HITS THE STOP LOSS THAT I SET 10 PIPS DOWN THE HARD STOP LOSS i dont understand sometimes it does and i get profits and bag much more BUT AT CERTAIN TIMES ID DOESNT WHY IS THAT I AM STILL USING DEMO FOR INFO , please answer if anybody can add some info . Thank you . It uses standard pips as input parameters. If you want it to work with fractional (5-digit) pips, just set the values divided by 10. So, it should 2 instead of 20 in your example. Thanks for that code, I will try it out. The only problem I have found is that it will not work on any MT4 platform except IBFX! And that is a bit restrictive if you want to try other MT4 brokers for various reasons. Is there anyone with a similar but ‘open’ EA? Do they provide .mq4 file of the EA or just .ex4? In the second case, it won’t be possible to modify it to work with other brokers. But it’s probably not that difficult to code such EA. Can you describe its algorithm in details? Thank you very much for the useful information and the timely responses to peoples’ questions. I had wanted to ask, is there a way of using this script to loosen/tighten trailing stops? Like for example once x pips have been reached in favour, increasing the amount that the stop trails by, and subsequently once y pips have been reached in favour, decreasing the amount that the stop trails by back to the original amount. Do you know of any way or of any EAs that i can use to achieve this? So, you basically need a varying trailing stop, right? By what rules should it vary? Can you offer an example? Essentially yes I am looking for a trailing stop that I can vary the trailing distance once a specified amount of points are reached, and also want it to trail point for point (frequency of 1). and set Trailing Stop of 100 points to newly opened position. 3. Once 300 points of profit reached, loosen Trailing Stop to 300 points. 4. Once 700 points of profit reached, tighten Trailing Stop back to 100 points and leave as it. Any help with this is greatly appreciated, thanks. Before reaching 200 points of profit you’ll have 100 points TSL, which will continue setting SL up after break even. When you’ll have 199 points of profit, it will set SL to BE + 99. But then, when you have 200 points of profit it will have to set back the SL back to BE. Isn’t that strange? The same will happen with step 3. At step 4, your SL will jump up steeply. Yes you are correct, this is the setup that I desire. It is my intention to have a 300 point TSL ultimately, but in smaller increments allowing me to break even at any given point until this 300 point TSL is achieved. I want to allow the profit to actually reach 200 points BEFORE setting the 2nd TSL to 200 points, rather than setting it to 200 points once I have reached only 100 points of profit, which would actually result in a -100 point position (loss) if the TSL is triggered. I hope this is clear, it may sound strange however was well thought through; essentially I want to be able to subsequently increase the trailing distance as certain profit levels are reached; can you please provide assistance with respect to script(s) or an EA for MT4. As you can see it’s quite easy to modify it to add more levels of trailing stop-loss if you need it. Ok, so I have tried out this EA multiple times over the last couple of weeks at different price points using both buy and sell orders, and it isn’t working correctly however I still believe it was well coded and you are extremely knowledgeable as a programmer. The problem that I have is that even with this code, the trailing stop kicks in once I am only 5 points/pips in profit instead of the 100/200/300 point setup I would like as discussed above. Is it possible that this is due to the OrderTakeProfit() part of the function in OrderModify? It looks like a small, simple fix however I am unable to figure it out. 1. Don’t insert such huge pieces of code into comments. Share your file on some hosting and just post the link here next time. 2. From what you’ve posted, it looks like you didn’t follow my instructions to insert the additional code for your trailing stop loss levels. Please download the clean version again and insert the pieces of code as described in my previous comment. I disagree that the trail should only activate when the position is in a profit. Don’t we also want to limit our loss? The point of a trailing stop? and please explain how i will install it and use it. please i am waiting seriously and where i can place it for usage. Hi, thanks for this information. How would you modify the code to be a percentage of the profit? and also a starting pips amount – say 10 pips in profit. stop loss = (current price -order open price) * trailing stop percentage. 1. Declare the input parameter as you’ve wrote. This way, you’ll be able to set percentage stop loss in your new input parameter, while the old TrailingStop input parameter is used to set the minimum value in pips for profit to use the percentage trailing stop. In your example, you’d have to set it to 10. Thanks for this. I tried so long to try and implement something like this in my EA. I was getting stuck on the (Bid – OrderOpenPrice() >= TSTP)) components. I have been learning coding from existing EAs and the order functions are alot difficult for me than bools and indicators. This is the trailing stop % EA I got working. I’m going to try and program a percentage trailing stop with different trail stop levels. I prepared an EA on the idea I had above and based on the information you gave to ronnie k regarding different trailing stop levels. I believe this code works however it does give some funny information when its calculating the stop loss. the stop loss appears to be the same as the other currency pairs at times. However eventually it settles on the correct stop loss. The other thing is that if there is a starting stop loss then the trailing stop would calculate from this stop loss (eg 40 pips as below) rather than the price at the initial trade. I am not sure how to stop this. it would be good if you could verify the code as the stop loss seems to move backwards with the price at times as well. Hi – I think the logic in the above post is right. The only problem is that the trailing stop will move backwards if price moves backwards. How can I stop the price moving backwards? I am trying a few variations with no luck. I won’t post any more code as it clutters the thread however I can send the EA when its finally working right to you to post on your site. To stop the trailing stop from moving backwards with the price, you have to check if the stop-loss you are trying to apply is higher (lower for short positions) than the existing one, and call OrderModify() only if it is. To prevent cluttering the post with the code, you can either upload your EA to some file sharing site (like DropBox) and just post the links here, or switch to our EA forum and attach the .mq4 files to your posts directly. Does this always keep the SL to the value I set StopLoss to when moving in the profit direction all the time? I have this implemented and it doesn’t look like it is. So if I set the S/L to 10 right when this script starts it does set 10 pips away from current price. But it doesn’t seem to be updating itself as the price moves in the profit direction. I’m looking for something that keep the S/L 10 pips at all times but only when moving in the profit direction. Am I missing something? Note that I put your code in my own script that does an infinite loop in the start(). So not sure if something needs to be refreshed or something? I really don’t know if running an infinite loop inside start() function is a good idea. The input parameter “StopLoss” is used to set a fixed stop-loss only once. You should use the input parameter “TrailingStop” if you want it to trail your profit. BID and ASK only bring the current chart Pair price. You should use MarketInfo(pariname, MODE_BID) for each pair price. I think that using trailing stops is something most traders especially new traders tend to ignore although i consider it as a security tool for my account .. the truth is that many traders don’t accept to get out of the market hoping for further profits however they will leave the trades till it become negative ! Am I right in thinking you can’t set 2 or more take profit levels in MT4? I use the bullpips method with great results and have noticed that using take profit at 1:1 and second at 2:1 reward/risk ratios is even more profitable. Unfortunately I have to do this manually at the moment as I can’t see how to set it up in MT4 other than open 2 separate trades. Any ideas? In MT4, you’ll have to use either 2 separate trades for that or opt to use an EA that would close positions partially. In MT5, you can set as many TPs on a position as you wish. This is exactly what I was looking for. I’m still new with FOREX and MT4 so thanks for the post. It has helped a lot. Please can trailing stop work when my computer is off.I mean after entering trades activate the trailing stop,let say i off my system.can the trailing stop be working while the system is off? No, you would have to use VPS for that. Thanks for this. I compiled it and added it to my custom list. I assume until I actually place an order I will not see anything to show the trailing stop indicator will work correctly. For example, the smiling face only appears on your chart when there is an open trade, is that correct? Also, when I make a trade, do I have the ability to set it as a trailing stop trade, or do I just set it as a stop loss trade and the indicator takes over from there. You need to attach the EA to the chart for it to work. It should be showing the smiling face all the time, otherwise it is not active. The EA applies trailing stop to all orders, irrespective of whether it has a preset SL or not. Now I am pretty much cleared about the trailing stops. Thanks for this informative post. The code for this trailing stop is (because of the two disadvantages) INCOMPLETE! Why didn’t the individual correct these flagrant deficiencies? What disadvantages do you mean? I wanna ask you that when we apply this EA to the chart having already running trades with positive as negative points, lets say +96 or with some loss as -66, in that case how this EA will work. It won’t do anything with a losing trade. It will apply trailing stop to the profitable one – it well set stop-loss to (Current Price – Trailing Stop) value. and Ask for running Sell order and not Bid? Shouldn’t it be the other way round? You are right, but Buy is closed at Bid, so if we set TrailingStop to 20 pips and expect to get at least 20 pips of profit when it is activated, we have to wait for Bid – OpenPrice to be >= 20 pips. If we would monitor Ask – OpenPrice, the resulting profit would be Spread size less than 20 pips. The same is true for Sell orders. Hello, or and how to download it? Thank you. There is a download link in the post – just below the source code. Yes, that and re-compile the file in MQL Editor. Great, thanks! this one’s handy! Where did you find that “pip adjust”? Slippage is the difference between the request order execution price and the actual order execution price. For example, you sent a trading order to buy EUR/USD at 1.3072, but it got executed at 1.3074 – that is 2 pips slippage. I was hoping you would help me with it. Then you would do better by asking me to help you with something specific. Moreover, what does it have to do with “Trailing Stop in MetaTrader 4”? I didn’t know where esle I can put. Is there a specific thread where I can put my queries?? I’m looking for months for the following solution and maybe you could help me with this. I want to have a trailing stop that starts with a sensitiveness of 5 when the position moves 20 pips in my direction. At the same time the stop loss should move to 15 pips past the breakeven point. I’d like to give you an example. Should the position go up again past 1.0022 then stop loss moves accordingly. The principal is the following: If position moves up, then there stop loss moves along. If it goes down there is the security of 5 pips according to the last high before we are stopped out. I hope I could explain this. Is there are a way to implement this in the source code given above? Would be nice if you could help me with this. Please upload the mq4 file to some file sharing website and post your link here. There is no need to insert such large pieces of code in the comments. Thanks! Hello admin, I’ve tried your EA recently, but it didn’t work if I put Stop Loss on my trades. It will just keep changing the stop loss all the time so they will work as no stop losses. but it works fine if I didn’t put any stop loss. Which version did you try? I mean which version of the Trailing Stop EA did you try? There are three of them in the post. That is quite strange, because it cannot remove stop-loss from an order that already has SL on it. Are you sure that the problem is caused by this EA? I replaced variable "i" with other character because it's already defined in my EA, is that the problem? Now, this gets really confusing. Does it remove stop-loss or does it move it backward? Please provide full details on what is going on with a trade – what level is it open at, what SL is applied by you, what SL is applied by EA and at what time? Thank you very much for this detailed explanation. I have found the bug and fixed it. Please try downloading the EA again (or copying it from the text if that is what you did) and see if the fix works for you. Thank you very much for such an awesome piece of work. I have two issue that I would greatly appreciate if you can assist me. 1. Is it possible to launch the EA using a script. I have a script that I use to place trades at a certain entry point with respective TP and SL. Originally I wanted a code to add to this script for TSL but after testing your Trailing Stop I fell in love with it. So that’s one. 2. Could you also kindly assist me with modifying the Trailing Stop version to work with varying Trailing Stop Loss with 3 levels TSL1, TSL2 and TSL3. The original Stop Loss that is placed with the script is variable; lets say it’s 10pips from entry position. TSL3 = If the market moves above 50pips the Trailing Stop should trail at 5pips for the rest of the trade. I use a five digit broker, though I’m not proficient with coding yet I’m sure I will be able to do the additional coding for the EA to work with the five digits as opposed to the norm. 1. As far as I know, it is not possible to launch EAs from within MT4 scripts. The EA works with both 4- and 5-digit quotes. It accepts input parameters in standard pips. Thanks, I studied the other recommendation on an earlier post and made some modifications to the code. It looks like it working but still performing more tests to verify if it’s working as expected. Hi, thanks for the EA. I have tried using the EA but it doesnt really work. I have tried both “trailing stop/ trailing stop on profit” but the EAs refuse to kick in even after profits rises. I combined your EA with a EA i used (which is based on MA crosses) but the trailing stop refuse to kick in. I did the compilation on META EDITOR and it shows “0 errors”. Though i have 2 stop losses on the new combined EA, i leave the “STPLoss” that is associated with your EA at 0, while i set the “StopLoss” of my MA crosses between 5-10. I even tried your EA singularly on open trades but it kick in. Are there any errors in Experts or Journal tabs of the Terminal window? What do you set TrailingStop input parameter to? The alert on the EA while trading keeps buzzing “Wrong stops, Retrying”. Sorry, but this EA does not issue such messages. Please check other attached EAs. Sorry, i tried your EA singularly but refused to Trail. If i attach your EA to a particular currency pair, will it work for other currency pairs that their trades are open? Or will it only work for that particular pair? If attached to at least one chart, it will work on trades on all currency pairs. Hi, Just noticed my new combined EA does not take profit even after surpassing the TP mark. Now i really really need your help!!! If TP was set on the order in MT4, then it should trigger disregarding your EA. It is applied by the broker’s server. well, the first issue i had with the MA cross EA was that i did not close trade after signal reversal, so i tried adding a trailing stop to augment for it. Please where can i paste the EA so that you can kindly help? I don’t quite understand… What does it have to do with my Trailing Stop EA? Please create a separate thread on forum if you have some problems with some other EA. If I attach the EA on separate charts with different parameters say; on seven pairs each with its own settings, will the EA apply the parameters of each chart accordingly? I haven’t been able to notice if it applied the parameters differently on all tests I have done. Do not do that. One Trailing Stop EA attached to one chart will try to modify orders on all symbols. I’m really liking this EA. All along I have been using it on its own and it worked well. I’m planning of using it along with another EA concurrently (let’s call it EA2). This EA2 will be attached to different charts. Since I need only to attach this Trailing Stop EA (we will call it EA1) on one chart and it applies the TSL settings on all charts with open orders. 1. Can EA1 work with this other EA2. This EA2 has nothing to do with TSL its got a totally different function altogether. 2. Let’s say I want to trade the following pairs, EURUSD, USDCHF, GBPUSD,USDCAD, AUDUSD and NZDUSD and I open orders of all these pairs. All these pairs would have EA2 attached with unique settings for each pair. Will EA1 work if I attached it to another pair say EURGBP without any open orders on it? Yes, EA1 will be affecting all orders independently on the chart it is attached to. Of course, it will use the same settings (TS size) to all these orders too. If your EA2 is only opening orders (without further modifications of SL), there should be no conflict in your situation. Hi! thank you so much for your informative post on trailing stop, some of my question has been answered but i still have 2 more question for more clarification. 2 lets assume that after getting a good entry signal from whatever system and i place a trade, but since i don’t know the extent at which the trend will last but i am sure it will get to my tp level, is there a software that one can use keep the trading on like a varying tp and a the same time a varying tsl to maximize profit. i hope you get my question. Sorry, but I do not get your questions. 1. How can a trailing stop lock profit at TP? Stop-loss cannot be set to the same level as TP because TP is always at the “other side” of the entry level. 2. Are you talking about partially closing a trade at some TP and applying trailing stop to the rest of the trade? exactly where i can add this code in my existing ea. Adding the TS code to the existing EA is not a straightforward process. You should understand how your EA’s code is working. Very helpful information is provided here . Please help me in my query. If i open and order at price 100.500 . if i want that Trailing stop of 20 points should be applied if price reach at 100.570 (i.e StopLoss will be selected at 100.550 and 50 points profit will be locked). Till reaching the price 100.570 the EA should not be triggered. Please provide me complete EA code. I will be very thankful to you. 1. Sir should i compile the “Trailing Stop.mq4” file and then attach “Trailing Stop.ex4” file to my chart or i should copy “Trailing Stop.mq4” file to \experts\ and attach it to my chart without compiling ? 2. I am using MT4 and my broker is providing 3 and 5 digits after decimal points . What (codes) should i amend in the source code to Start “trailing Stop” of 20 points at that time when 50 points of profit is achieved? 1. How will you compile “Trailing Stop.mq4″ without copying it to \experts\ folder? That’s a necessary step. 2. Sorry, I have misread your request. I though you were asking for a TS to activate when Profit=TS, not when Profit=SomeValue+TS. You would need to modify the code lines 38 and 52 by replacing TSTP with TSTP + (5 * PointValue). As for the decimal places problem, you would need to use 2 and 5 instead of 20 and 50 in your case. Because this EA uses standard pip definition, not fractional. No need to changed that in code. You could change that as an input parameter of the EA upon attachment. Sir, I am using MT4 of broker providing 3 and 5 digits after decimal point. What’s the output in the Experts tab? My best guess is that 2 and 5 pips is just to close for your broker to handle (check their stop levels for the currency pair you are trading). 1. If i attach Trailing Stop EA the chart of USDCAD, will it work for all the open trades of USDCAD? 2. Will it work for all the Chart (that are opened at that time) i.e USDCAD, GBPUSD. NZDUSD? or will it work for that chart only to whom it is attached (in our case USDCAD)? 3. Can i have different Trailing Stop EAs with different (Trailing Stop) settings and attach them to different charts at the same time? 1. It will all for all open trades, no matter if it is USD/CAD or some other currency pair. 2. It will work for all open positions. It does not distinguish between currency pairs. 3. Having two or more different TS EAs will create unpredicted behavior as they will interfere with each other. If you need to run two or more TS EAs, you either have to modify their code to exclude such interference or run them on two separate accounts. My first target was that “when my profit reach 90 pips , a Trailing Stop of 40 pips is to be activated/triggered”. You guided me and i achieved this target. Now my second target to attach this EA on a VPS. How i will do this? Install your broker’s platform on a VPS. Copy this EA to this VPS and attach it to a chart there. Thanks for the EA! It’s working out rather nicely, and I found a neat little work-around to get each individual open order to have different Stop Losses by maintaining a certain distance behind a rising (for buy’s) or falling (for sell’s) rate. I haven’t had much opportunity to really test it out yet and see what it can do, but I’m fairly optimistic. But anyway, thanks again! This is a nice EA, thanks. I think guruKrish was right. The EA will only work correctly if it is on a chart for a pair that is the same pair as the order it is trailing a stop for. If you have a USDJPY order on, and you attached the EA to a EURUSD chart, then it will use the Bid and Ask in the calculations for the EURUSD pair. The reason this matters is because it seems to loop through all open orders without checking if each is for the current chart symbol. Thanks for reporting! I have fixed the issue by adding a check for a proper symbol. my question is in above which ea can trail the order if i have already putting stoploss . means i have a buy on 167.000 and my stoploss is 166.950 . my broker is 5 digit. Any of those trailing stop EAs should be able to work with your orders even if you have already set your own stop-loss level. sir it possible this ea that on certain price like ask= 1.3000 or after that price. Maybe, but I have no idea what “this ea that on certain price like ask= 1.3000 or after that price” means. certain price like ask=1.3000 means suppose a pair is on ask= 1.2800 and i buy it some time letter it reach on 1.3000 . then i want start this ea to trail the buy. this is because for safety from market fluctuation . You can start it whenever you want. So do these EA,s now only work for the pair its attached to, I thought you only had to attach to one pair and it would work for all pairs? New version works only with the pair it is attached to. Thank you very much for your effort on this EA. It only saddens me it took me this long to find your work! I have a strategy where I place multiple orders on a pair, but there are different trailing stop loss sizes, allowing some of the orders more room to move than others. Is it possible to add a magic number parameter, or something similar, so that I can distinguish between say the 4 different trailing stop sizes I use? By adding the appropriate magic number in the comments section of each trade when placing it, the correct TS would be used. Thanks in advance! I’m not sure how to expand it to include multiple different magic numbers all within the same EA, but for now I’ve set up 3 individual EA’s with different settings, all running on separate charts. So it’s working, but probably not as efficient as it could do. I’ve not got any experience with coding, so it’ll take a bit of research and trial/error. Thanks for the starting point! It probably is not a good idea to insert all magic numbers into one EA. Attach one EA per order per chart. No, neither of the shared TS EAs do that. What number of trades can be controlled with this EA? In theory, it can control any amount of trades. In reality, the limit is based on the speed of your CPU and connection. Thank you a lot, you are making my life easier with your creation. Hi, thanks for great work. I know its not up to your code but I get 147 error which means my server does not allow to change the order. but actually I have some other EAs and scripts and even I have some small scripts that can change orders. meaning my orders can be changed “under some conditions”. can you suggest some ideas that I apply to your code so I can use it. can it be timing interval ? I know my broker doesnt let me use less than 40point trailing stops, for example. and again thank you for all your efforts. Error 147 means that you are trying to set expiration time for an order and your broker does not allow it (ERR_TRADE_EXPIRATION_DENIED). Please look into the function your calling and whether you accidentally set some non-zero expiration there. there was no zero so color parameter was interpreted like datetime. maybe because of metatrader version difference but hey…. and I set initial value to 8 to justify my broker’s parameters. Thank you for pointing out this bug! I have updated the code in the post and the downloadable files. I have heard mt4 trailing stops only work when mt4 is running (i.e. the pc is turned on and mt4 open – does this ea trailing stop work even when I’m logged out of mt4? No, this EA has to be running with the MT4 platform for it to trail the stop. a simple flag which allows to use this trailingstop either just on the current chart/pair or on all/any open orders will be a very nice and useful addition. There is no way to make this EA work with ‘current chart’ only. The best it can do is to work with the ‘current symbol’ (which it already does). Making it work with ‘all symbols’ does not make much sense as a trader will want different TS values for different currency pairs. First, I must admit that I have no idea how a trailing stop with TP instead of SL is supposed to work at all. Third, it looks like you are trying to apply a Sell-calculated trailing stop to a Buy-position here. It will not work. Would it be possible to modify this to run on JForex (Dukascopy)? I am not proficient in JForex platform and its coding language (if there is any). Try asking Dukascopy support or finding some qualified coder who has experience with JForex. The EA is rather simple and should be codeable in any programming language.